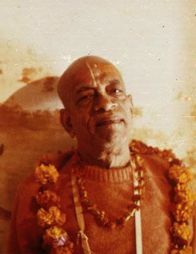 His Divine Grace A.C. Bhaktivedanta Swami Prabhupada (1896-1977), the founder-acharya* of the International Society for Krishna Consciousness (ISKCON), was the foremost proponent and teacher of Krishna consciousness—devotional service to the Supreme Person, Krishna—of the late twentieth century. Srila Prabhupada, as he's known to his followers, translated and commented on over eighty volumes of the most important sacred bhakti texts. His books include Bhagavad-gita As It Is—the definitive commentary on Krishna's advice on how to be happy in this life and the next, and the multi-volume Srimad-Bhagavatam—a history of Krishna's activities, His avatars, and His many devotees throughout the universe. Srila Prabhupada also constantly traveled the world, initiating thousands of disciples and managing a global spiritual movement which continues to grow today. 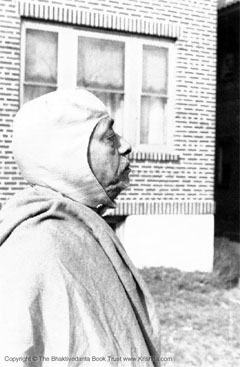 When Srila Prabhupada met his own spiritual master, Srila Bhaktisiddhanta Sarasvati Thakur in 1922, Srila Bhaktisiddhanta urged the young devotee later known as Srila Prabhupada to preach Chaitanya Mahaprabhu's message of Krishna consciousness in English. After forty years of struggling within India to carry out his guru's order while maintaining family and business responsibilities, Srila Prabhupada accepted the renounced order of life, sannyasa. He began writing translations and commentaries on the great Srimad-Bhagavatam, the cream of all Vedic literature. After producing three volumes, he boarded a steamship bound from Calcutta to New York City in 1965. At the age of sixty-nine, with forty rupees and a trunk of his Bhagavatam commentaries—the first ever in English—his aim was to introduce "India's message of peace and goodwill" to the western world. During the last twelve years of his life, Srila Prabhupada would inspire thousands of Westerners and Indians to devote their lives to Krishna consciousness, launching one of the fastest-growing spiritual movements in the history of the world. He considered his translations and commentaries as divinely inspired, practical guidebooks for the spiritual and material benefit of human society. Scholars familiar with his books regard Srila Prabhupada as a genuine, realized, and scholarly teacher of bhakti. His definitive writings have become standard university texts. With the help of his students, he founded the International Society for Krishna Consciousness (ISKCON). ISKCON is popularly known as the "Hare Krishna" movement, due to its members' widespread practice of chanting the Hare Krishna mantra in public. Srila Prabhupada intended ISKCON to facilitate the association and training of bhakti-yoga practitioners, and his followers continue to spread that mission. How the culmination of thousands of years of Vedic philosophical debate appeared as an unlikely export from India to the rest of the world. The freezing wind blasting off the river becomes merciless when funneled between the walls of the city’s chartered canyons. The wind hurtles a birdshot of cinder and sleet; it sends trash skimming over the icy pavement and lifts it in sudden dizzying spirals high up the face of the blank, impassive towers. A dull unending roar, as though the buildings moaned under a drugged sleep, fills the chasms. This most densely crowded city of America is also its most desolate waste, and nothing seems more inhospitable to man than the world where everything is man-made. This is New York, in the grip of an iron winter, in the middle of an iron age. We see now a figure making its way along the bottom of one of the empty iron-rimmed abysses. Leaning forward into the wind, a cane in his left hand, he moves steadfastly on. Look at him closely: the saffron robes of an Indian mendicant priest flap below his overcoat, and his forehead bears the parallel clay lines of the devotee of Krishna. His face has an expression both indomitable and serene, as though he were not really walking this bitter wasteland, and indeed he appears so out of place here that a magnolia tree in full fragrant bloom on these hard and frigid streets would seem no less incongruous. This is Srila Prabhupada in the winter of 1966. He is alone, he has no money; and he is seventy years old. His small figure is dwarfed by the towers in icy reserve, whose stern, impervious faces turn all human effort on the streets below into tableaux of defeat. But Srila Prabhupada’s effort is not merely human, and the seed he brings with him from another world does indeed incredibly, miraculously take root in this barren and uninviting soil and flourish. Soon hundreds of saffron-robed devotees will blossom out into these streets, their American faces marked with the twin clay lines, and the sound of the Hare Krishna mantra will echo and re-echo against the hard high walls. We should remind ourselves that what we see is not all there is; we never know what unseen presences hover over some lonely and modest endeavor, nor what invisible efforts cooperate to bring great results from meager beginnings. We believe that in nature no effect exceeds its cause, why should it be different in other affairs? Chance or luck are merely words to cover our ignorance. Behind Srila Prabhupada’s appearance on the alien Manhattan streets stand five millennia of planning and effort. 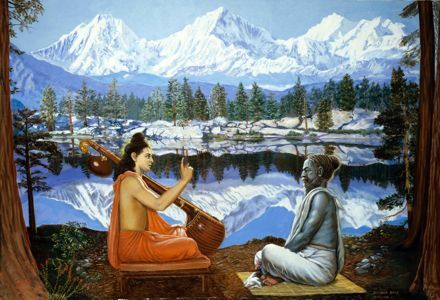 The story of it opens one sunrise fifty centuries ago in the Himalayas, where the sage Krishna-Dvaipayana Vyasa sits in trance on the bank of the Sarasvati. In his meditation, Vyasa sees a future of unrelieved horror unfold before him. He sees Kaliyuga, the age of iron, begin and bring with it universal deterioration. The decay is so deep-rooted that matter itself diminishes in potency, and all our food progressively decreases in quality as well as quantity. Vyasa sees the effects of chronic malnutrition on generation after generation; he watches it gradually diminish their span of life along with their brain power; no one can escape the progressive drop in intelligence and ability to remember. The harassment of hard times upon an increasingly witless populace hastens its moral and spiritual decline. People begin to slaughter animals for food; they become more and more enslaved by drugs; they lose all sexual restraint. These habits further their physical and mental deterioration. Vyasa watches them sink deeper and deeper into sensuality and ignorance. Families break up, and women and children are abandoned. Increasingly degraded generations, conceived accidentally in lust and growing up wild, swarm over the earth. Leadership falls into the hands of unprincipled criminals who use their power to loot the people. The world teems with ideologues, mystagogues, fanatics, and spiritual bunko artists who win huge followings among a people dazed by social and moral anarchy. Unspeakable depravities and atrocities flourish under a rhetoric of high ideals. Vyasa sees horror piled upon horror; he sees the end of everything human; he sees the gathering darkness engulf the world. This is Vyasa’s prophetic vision on the eve of Kali- yuga, five thousand years ago. It spurs him into action. For Vyasa’s appearance on the brink of this temporal decline is not fortuitous. Vyasa is an avatara, the empowered literary incarnation of God, sent by Krishna specifically to prepare the knowledge of Vedic civilization for transmission through the coming millennia of darkness. Without such an undertaking, the erosion of human intelligence by the force of time would insure that all future generations would be completely cut off from their own cultural heritage and the matchless spiritual attainment of their forebears. Once the iron age began, they would not even realize that at one time the whole world had been governed by a single, supremely enlightened civilization: the Vedic culture. In that Vedic culture, everything was organized to further self-realization. Self-realization marks the ultimate development of human potential, in which a person knows himself directly as an eternal spiritual being, infrangibly bound to the supreme spiritual being, and without intrinsic relation to a temporarily inhabited material body. By cultivating self-realization, the Vedic civilization brought off this unparalleled achievement: it was able to eliminate completely the evils of birth, old age, disease, and death, securing for its members an eternal existence of knowledge and ever-increasing bliss. The Vedic culture recognized that not all souls who took human birth after transmigrating up through the animal forms would be able to make direct progress toward the supreme goal. Owing to different histories, people are born with different qualities and abilities. Nevertheless, Vedic culture enabled everyone to make some advancement, and there were many arrangements for the gradual elevation of materialistic people. In any case, Vedic culture organized life so that everyone could satisfy the basic necessities in the simplest and most sensible way, leaving most of human energy free for the higher task. Vyasa saw that all this would disappear in Kali-yuga, since the focus of civilization would shift from self- realization to sense gratification. Yet even though Kali-yuga could not be stopped, he would be able to mitigate its effects and keep alive the tradition of spiritual culture, in the way that emissaries of a higher civilization can preserve their heritage among barbarians, or that a well provisioned village can survive a raging winter. Vyasa had mastered all the knowledge of Vedic culture- social, scientific, economic, political, ethical, aesthetic, and spiritual. This knowledge was gathered in a comprehensive canon called the Veda, a word that means, simply, “knowledge.” Until the time of Vyasa, the Veda was not written, because writing had been unnecessary. Far from being a sign of intellectual advancement, the appearance of writing is a testimony of decline, a device seized upon to compensate for that mental deterioration which includes the loss of the ability to remember. It is interesting, by the way, that the Vedic date assigned to the advent of Kaliyuga (c. 3000 B.C.) corresponds closely to the date set by modern historians for the rise of civilized life, an event signaled by the appearance of literacy and the emergence of complex urban societies. All that historians recognize as recorded human history is, in fact, only human history in Kali-yuga. The academic historians’ ignorance of the earlier and incalculably higher Vedic civilization is what we have to expect from people suffering from the mental retardation imposed by the times. We see symptoms of this intellectual degradation of modern thinkers in their avowal that sense perception is the only source of knowledge and in their obliviousness to the dependence of knowledge upon goodness. Inverted values warp their ideas, such as the conviction that human progress resides in the proliferation of complex urban societies and increasingly sophisticated technology. They are unaware that simple living is the best basis for high thinking, and that a truly advanced civilization minimizes exploitation of nature and social complexity. They do not know that the real standard of progress is the caliber of people society produces. If we pursue material advancement at the expense of self- realization, measuring our standard of living only by the gratification of our senses, then we will only get a spiritually and morally debilitated people in control of an intricate and powerful technology -a terrifying combination that leads to horrors on a scale we are just be-ginning to experience. To give us access to an alternative, Vyasa divided the Veda into four and wrote it down. Yet he knew that we would still be unable to understand the Vedas, and so he composed a number of supplementary works in which he spelled out the intentions of Vedic thought explicitly. In this Vyasa was aided by Sri Krishna, the Supreme Personality of Godhead, Himself. Acting in tandem with Vyasa’s effort, Krishna had descended personally onto this planet and, as a member of the royal order, had played a significant role in recent political events. Vyasa took advantage of Krishna’s activities and chronicled those times in a vast epic narrative called the Mahabharata.In this sprawling dynastic tale of love, ambition, intrigue, and war, of fidelity and treachery, heroism and cowardice, transcendence and ignominy, Vyasa imparted Vedic thought in a way even unphilosophical people would find engrossing. Krishna’s presence, surcharged history with transcendental significance. Moreover, in the middle of this sweeping narrative, like a jewel placed in a gorgeous setting, Vyasa set the Bhagavad-gita; Krishna’s discourse to Arjuna before the climactic battle at Kurukshetra. In a laconic seven hundred verses, Krishna gives Arjuna what He calls “the most confidential knowledge” of the Vedas.Like Vyasa, Krishna Himself is preparing Vedic knowledge for Kali-yuga. This entails taking the highest knowledge of the Vedas,so sublime and pure that, as Krishna says, even great souls rarely attain it, and laying it out explicitly, openly—available to everyone. So that there would be no question about the validity of this daring exposition, Krishna, the highest possible authority, delivers it Himself. You may question why the most advanced knowledge in the Vedas is “confidential.” If it is so important for us to know it, then why is it hidden in the first place? The answer is that knowledge is available only to those qualified to apprehend it. Education is progressive, and higher knowledge can be approached only by graduates from the lower, In particular, the qualification necessary to comprehend the mysteries concerning the ultimate source of everything is purity. Only those whose senses are under complete control and who are free from all material desires have the requisite purity to understand and directly perceive the Absolute Truth. Because people are characterized by a variety of material desires, the Vedas offer many religious paths (called dharmas). These are gradated so that people in different statuses of material contamination can ascend step by step to higher states of purity and correspondingly higher disclosures of the divine. In the Gita, Krishna systematically surveys the major Vedic dharmas and shows how each directs a person toward the ultimate conclusion, that “most confidential of all knowledge.” Krishna analyzes the performance of sacrifices and the worship of demigods; he discusses the yogas of work, meditation, and knowledge. In each case, Krishna shows how it leads to the “most secret of all secrets,” pure loving devotional service to God. “Always think of Me and become My devotee. Worship Me and offer your homage unto Me.” This, Krishna says, is “the most confidential part of knowledge.” Since all the Vedic dharmas lead to this one “supreme secret,” Krishna can offer us this final instruction: “Just abandon all varieties of dharmas and surrender to Me.” In other words, we need not bother with any of the different paths; we can at once come to their common goal, surrender to Krishna. But if this supreme end is so difficult to reach, requiring the ultimate in purity, how is Krishna able to offer it directly to everyone? The answer is simple. Krishna says that if one begins devotional service, He will personally purify the devotee. “To those who are constantly devoted and who worship Me with love,” Krishna says, “I give the understanding by which they can come to Me.” A person can circumvent all the Vedic dharmas and come directly to Krishna because Krishna will kindly help him. This is an extremely important point. As Kali-yuga progresses, all the dharmas become increasingly difficult to pursue. Our intelligence, our memory, and our stamina have all decreased, but Krishna is willing to compensate for all our infirmities by His personal effort. In essence, by opening up through divine kindness direct devotional service, the Bhagavad-gita renders every other Vedic dharma obsolete. Vyasa made this message the centerpiece of the Mahabharata.Vyasa also expanded upon the Vedic teachings in eighteen Puranas, and he compiled an outline of the philosophical conclusions of the Vedas in the Vedanta-sutra,a collection of extremely compressed, aphoristic utterances; later thinkers would present their understandings of Vedic thought in the form of commentaries on these shastras. After Vyasa completed his immense labor, he was surprised to find himself dissatisfied. As he reviewed his efforts to discover what deficiency could be at the root of his discontent, his guru, Narada Muni, arrived at his ashrama. Vyasa placed the matter before Narada. Narada wanted Vyasa to describe more completely the transcendental qualities and activities of Krishna because, he said, by hearing them people would be able to relish their extraordinary spiritual flavor; people’s natural attraction to the Lord would be revived, and as a matter of course they would lose their taste for mundane pleasures. Narada counseled Vyasa about the spiritual potency of words that glorify Krishna: when spoken in pure devotion, those words enter into the hearts of the listeners and destroy almost completely the impurities of passion and ignorance. With Narada’s blessings, Vyasa then completed his masterpiece, the “ripened fruit of the tree of Vedic knowledge,” Srimad-Bhagavatam. The Bhagavatam picks up where the Gita leaves off, for Vyasa explicitly states that it is intended for those who have already abandoned materially motivated dharmas. Here Vyasa discloses the inviolable mysteries of the personal life of the Supreme Lord Krishna, His eternal loving affairs with His most confidential and intimate devotees. Here we have spiritual life revealed at its most intense and personal, at the absolute summit of love of God. We see from the cooperative efforts of Krishna and Vyasa at the beginning of Kali-yuga that there was a move to make the esoteric knowledge of the Vedas, the highest truths concerning the nature of God and our relations to Him, open and potentially available to everyone. This unprecedented disclosure had its dangers, and neither Krishna nor Vyasa could circumvent the stricture that these confidential truths could be understood only by those utterly pure in heart. They could not waive the requirement of purity, but what they did do was make available a correspondingly more powerful process of purification—in the Gita Krishna offers personally to help anyone sincerely engaged in devotional service, and in the Bhagavatam Vyasa offers the most potent of all purifying processes—the chanting and hearing of the glories of Krishna Himself. A few thousand years after the onset of Kali-yuga, the followers of the Vedas—now restricted geographically to India—began more and more to slaughter animals for food. Meat eating is so polluting to human consciousness that indulgence in it makes any sort of spiritual realization virtually impossible. Therefore, the Vedas had always instructed against it. At the same time, it was recognized that some people, in spite of all prohibitions, will eat flesh anyway. Accordingly, for them the Vedas enjoin that if someone wants to eat flesh. he may sacrifice a goat (no other animal) on the night of the dark moon (no other time) to the goddess Kali. The sacrificer, furthermore, must whisper into the goat’s ear a mantra that says, “I am killing you now, but in my next life you will have the opportunity to kill me.” By sanctioning meat-eating in this way, the Vedic culture at least kept it under control: only a goat, only once a month, and only in the unpleasant consciousness of its karmic price—all very discouraging conditions. However, as the brahmanas, the Vedic priests, in Kali-yuga became degraded, they began to proliferate animal sacrifices—to meet popular demand—by explaining away or ignoring the restrictions. Temples were transmogrified into slaughterhouses, and killing as an organized daily business flourished. If anyone objected to this unprecedented evil, the priests would reply that it was, after all, sanctioned in the Vedas. Therefore, to stop the animal killing, Krishna descended as Lord Buddha (c. 500 B.C.). Because the Vedas were being perversely used to justify the slaughter, Krishna, as Lord Buddha, denied the authority of the Vedas—thesame Vedas He had so carefully arranged and explicated to save the people in Kali- yuga. But it was an emergency, and there was no alternative. Lord Buddha rejected the Vedas and preached the ethic of ahimsa, of noninjury to all living beings. The Buddha also taught that our material existence is suffering, that our material desires cause our suffering, and that by extirpating these desires we can attain nirvana, release from material existence. Lord Buddha refused to deal with any question concerning God, the soul, life after salvation, and so on. When asked about such things, he would reply, “the Tathagata [the Buddha] is free from all theories.” Later, some of his followers spread the doctrines of shunya, voidism, and anatma, no soul, but these were mundane interpretations of the Buddha’s silence on transcendental topics. The simple fact is that Buddha had denied the Vedas, yet he remained faithful to them by refusing to make “theories,” that is, to discuss God or the soul independently of the Vedic teachings; so he said nothing. Their consciousness polluted by meat-eating, the people had become atheists. But Lord Buddha, who never said anything about God, won their devotion. Thus Krishna tricked the atheists into worshiping Him in His incarnation as the Buddha. Lord Buddha’s mission was successful. All of India eventually took up his teaching, and animal slaughter ceased. Lord Buddha exemplifies the transcendental cleverness of Krishna. Yet while Lord Buddha’s success averted the immediate danger, it left India without respect for the Vedas and in the grip of a philosophy that denied God and the soul. The Buddha’s palliative was incomplete; it was only a first step toward a complete Vedic restoration. Krishna’s next move was to send an incarnation of Lord Siva to execute the second step. This was Sripada Sankaracarya, who appeared in A.D. 788. In a life of only thirty-two years, Sankara drove the Buddhists out of India and reestablished the authority of the Vedas. A member of the renounced order, a sannyasi, Sankara was a thinker of immense power, and he dedicated his formidable ability to persuading the followers of Buddhism to accept the Vedas. To do this effectively, Sankara had to make the transition between the two easy, so he devised a philosophy called advaita-vedanta, or absolute nondualism, a kind of crypto-Buddhism that he ingeniously expounded in Vedic language and supported with Vedic texts. Sankara denied the Buddhist doctrine that the ultimate truth is void; the truth, Sankara argued, as the Vedas declare, is Brahman, spirit. Sankara likewise confuted the Buddhist doctrine of no soul or self, and reestablished the Vedic truth of the atma, the individual soul. However, Sankara asserted the identity of atma and Brahman as an undifferentiated spiritual reality without any qualities, varieties, or relations. Obviously, there is no cognitive difference between “void” and “Brahman” without qualities or distinctions. Sankara’s Brahman is an intellectual clone of the Buddhist “void.” Thus, Sankara eased the way for acceptance of the Vedas. Sankara’s philosophy of impersonal oneness has some basis in the Vedas. For neophyte spiritualists, whose residual material contamination prevents them from understanding the transcendental nature of Krishna, the Vedas gave instruction for salvation by merging into the impersonal Brahman, Krishna’s spiritual effulgence. Associated with those instructions are texts that emphasize the qualitative oneness of atma and Brahman. The Vedas contain other, equally important texts that say that the atmas are numerically distinct and quantitatively different from the supreme atma. Krishna, but Sankara stressed the oneness. He presented transcendent reality in an abstract form and so made the Vedas palatable to the Buddhists. Sankara restored Vedic culture; he founded monasteries, organized the brahminical community, and reestablished the worship of Vedic deities. The Vedas were recognized again, although necessarily in a distorted fashion. Buddhism is an advancement over gross materialism, and impersonal monism over Buddhism; but the personal theism of the Vedas, as set out by Vyasa and Krishna, had yet to be restored. After Sankara, that work began. As people returned to Vedic study in earnest, many began to recognize the deficiencies in Sankara’s monistic interpretation. Several powerful teachers arose—most notably Ramanuja (1017-1137) and Madhva (1239-1319)—whose cogent commentaries on the Vedanta-sutra and the Bhagavad-gita seriously challenged the Sankarite hegemony and gained theism a wide following. But the impersonalists retained civic control. Then about five hundred years ago Krishna descended once again, this time to complete the restoration of Vedic culture. This is Sri Chaitanya Mahaprabhu. Sri Chaitanya is Krishna in the guise of His own devotee, teaching by His example the supreme form of worship. Chaitanya’s mission had two sides. On the one, He even more fully disclosed the nature of the highest love between Krishna and His most intimate devotees, and Chaitanya was continually merged in the ecstasy of that love. On the other side, Chaitanya accompanied this revelation with a correspondingly more powerful means of God realization—the chanting of the Hare Krishna maha- mantra. This mantra is part of the original Vedas, but because it was chanted by Sri Chaitanya, its power increased multifold, and Chaitanya taught His followers the practices by which the power of the mantra could work unimpeded. Chaitanya also delivered the most comprehensive understanding of Vedic theism. 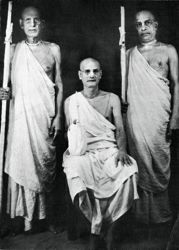 He confronted, in person, the two greatest impersonalists of His time—Prakashananda Sarasvati and Sarvabhauma Bhattacarya—and presented such a powerful theistic exposition of the Vedanta-sutra that both acknowledged devotion to Krishna to be the goal of the Vedas, and they danced and chanted with Chaitanya. All the work of Krishna, Vyasa, Buddha, and Sankara to establish Vedic culture in Kali-yuga reaches its fulfillment in the appearance of Sri Chaitanya Mahaprabhu. In the original Vedas, the Kali-santarana Upanishad had disclosed, “One cannot find a method of religion more sublime in the Kali-yuga than the chanting of Hare Krishna.” And looking forward to the coming of Chaitanya, Vyasa had recorded in the Bhagavatam:“In the Age of Kali, intelligent persons perform congregational chanting to worship the incarnation who constantly sings the name of Krishna. Although His complexion is not blackish. He is Krishna Himself. He is accompanied by His associates, servants, weapons [i.e., the Hare Krishna mantra], and confidential companions.” Sri Chaitanya Mahaprabhu, then, is the long-awaited deliverer of the means of spiritual realization for this age. Ten spiritual masters in succession have passed Sri Chaitanya’s teachings down to Srila Prabhupada, and it is only appropriate that we should find him, in the winter of 1966, far from his native India on the wind-racked streets of New York, center of the global technological civilization, heartland of Kali-yuga. It is the best place for him to carry the seed of Vedic culture. It is here that the work of Krishna, Vyasa, Buddha, Sankara, and Chaitanya, in the care of their empowered servant Prabhupada, flowers and bears fruit. The photographs show Srila Prabhupada in the mid nineteen-sixties. A Peace Corps worker on assignment in India resolves to follow the transcendental call. One hot smoggy day in the summer of 1968, I went for a walk in New York's Greenwich Village, browsing through the occult bookstores. As I stood inside one store, reading a small pocket copy of Bhagavad-gita, I saw an incredible sight: a group of young men and women in robes and saris, dancing double-file down the sidewalk. The men had shaved heads, and they were playing clay drums and cymbals. They were singing a song that they repeated to a simple melody, and it seemed to me I had heard this song before. I was very attracted. All the way home, I tried to remember where I'd heard that song before. I went through all my record albums, and then finally it came to me—the Hair soundtrack. I played it time and time again: " Hare Krishna, Hare Krishna, Krishna Krishna, Hare Hare/ Hare Rama, Hare Rama, Rama Rama, Hare Hare." My parents had already planned a future for me: a good education and a good job. It wasn't that I consciously rebelled against them, but some unknown force seemed to be leading me in another direction—India. The dream of visiting India had grown with me since childhood. I'd seen pictures in National Geographic of lush tropical forests and jungles, magnificent temples, and fabulous festivals. By the time I finished a college course on Eastern philosophy, I was convinced I had to go. There were questions that I just had to find the answers to, and I sensed that the answers were hidden somewhere in that ancient tradition. I couldn't just tell my parents that I was going to India for a spiritual search. So I decided to join the Peace Corps as a teacher and work in India. On the application form were three blank spaces for desired assignments, and I wrote India in all three spaces. Six months later I was on a plane bound for Delhi. One day on a crowded Calcutta train, I saw a poster advertising a Hare Krishna festival at Deshapriya Park. I was elated; weren't these the people I had seen singing on the streets in New York? I turned to a Sikh gentleman in a large turban and asked, "Deshapriya Park—where?" Silently he pointed back in the direction we had just come. I struggled to get off the overcrowded train. Hurrying through the streets, I began asking everyone—sweepers, stall owners, police—where I could find the park. But by evening I still had not located it. Finally I began to look for a taxi, abandoning the search for the day. It was now evening rush hour. I ran up to a taxi that had stopped at a traffic light, although it was too dark to see if there were passengers inside or not. "Take me to Free School Street," I said, jumping in. I glanced over to my side, and there in the corner, amid piles of books and magazines, was a shaven-headed devotee in orange robes. "Hare Krishna!" I shouted excitedly. "Hare Krishna," he replied, somewhat surprised. "I've been looking for you people all day," I said. "I saw a poster advertising a festival in Deshapriya Park, but I can't find the place." "It's just nearby," he said. "You came within two minutes of it. I'm going there now." Within two minutes we pulled up in front of what looked like a large park. The entire park was covered with a huge circus tent, and under its canopy crowded almost fifteen thousand people. At the far end of the pavilion was a big stage, and at its center was a simple raised dais. There sat the founder and spiritual master of the Hare Krishna movement, His Divine Grace Srila Prabhupada, regally wearing scores of flower garlands offered by his disciples. He sat silently as one of his disciples introduced him to the crowd. When the disciple explained that Srila Prabhupada had traveled alone at the age of seventy to boldly preach Krishna consciousness in America, the audience responded with a standing ovation. The devotees jumped to their feet to lead them in the chanting of Hare Krishna. When the program was over and Srila Prabhupada was being driven away in his car, I ran up to the devotee who had spoken. "Can I come?" I begged. "I'd like to meet the guru." "Sure, jump in," he replied, smiling. We sped off, arriving fifteen minutes later at a huge old Victorian mansion, a remnant of the British raj. The interim had been converted into a temple. As we entered the temple, the devotees invitee me to meet Srila Prabhupada and to ask him any questions I might have. Srila Prabhupada was sitting on a cushion behind a low desk. Six or seven Indian gentlemen surrounded him. I had always thought that if I ever met a guru I would ask him all the many questions that had haunted me over the years. But as I entered Srila Prabhupada's room, I couldn't remember a single question. I folded my palms and sat down nervously before him. Srila Prabhupada looked at me and smiled warmly. "You have some questions?" he asked in a deep but gentle voice. I couldn't remember any of my questions. Suddenly, something inside inspired me to challenge him. Considering myself somewhat knowledgeable in Buddhism, I thought to ask him about another, equally valid spiritual path. "What about Buddhism?" I challenged. "Speak about Buddhism," he replied, totally undisturbed by my attack. Fool that I was, I had to answer. I began to rattle off something I had read in a book about the eightfold mystic path. But soon I exhausted my knowledge of the matter and felt totally deflated. Srila Prabhupada's face broke into a broad, radiant grin. He briefly explained that Buddhism was impractical because the soul is eternal and has personality, being part and parcel of the Supreme Personality of Godhead, Krishna. The soul can never be extinguished by the philosophical process of negation. Srila Prabhupada defeated me not out of a desire to establish his own erudition but out of concern and compassion. Immediately I felt great respect for him. Srila Prabhupada returned to his discussion with the other gentlemen, and I paid my obeisances and left the room. The next day I had to return to my Peace Corps work in Bihar, about two hundred-fifty miles west of Calcutta. Already I was developing a bad taste for my life there. I seemed to be just killing time, living from day to day. I began to feel that my existence was bland compared to the fresh and colorful lives of Srila Prabhupada and his devotees. Within a month I returned to Calcutta and went straight to the temple. Srila Prabhupada wasn't there, but the devotees welcomed me like a prodigal son returned. They fed me delicious vegetarian food and answered my barrage of questions and philosophical doubts with incredible patience. That evening, as I prepared to leave for my hotel, one of the devotees told me about a festival they were holding in Mayapur. Srila Prabhupada was there, as were many devotees from all over the world. An Indian boy named Manohara offered to take me with him the following day. Happily I accepted. The next day we boarded a steam train that must have been left over from the Second World War. It was a five-hour journey to a country town called Navadvipa, where we hired a ricksha that took us through the town's center. Next we had to take a small wooden boat across the river Ganges. After thirty minutes of utter silence, except for the gentle splash of the water against the bottom of the boat, we had crossed the confluence of two Ganges branches. Paying the boatman a few coins, we again boarded a ricksha. The azure sky was dotted with wispy clouds. Birds whistled and chattered in the dense undergrowth that practically engulfed the narrow road. Finally we stopped at a small encampment of rugged canvas tents. "This is Mayapur," said Manohara, leading me to Srila Prabhupada's hut. Srila Prabhupada remembered me from our brief meeting in Calcutta and welcomed me warmly. It was wonderful to see him again. He sat on a clean white cushion, and he exuded an aura of perfect peace and tranquility. "So, do you have some questions?" he asked me. I didn't want to foolishly challenge him again. Within my mind I decided to at least theoretically accept that this person knew the Absolute Truth. It wasn't real surrender, only an intellectual adjustment. But it was a large step for me. I asked Srila Prabhupada about science as a way of finding truth, and he began to explain about the all-attractive spiritual nature of God, Krishna, and about how everything has its source in Him. Everything about Srila Prabhupada enthralled me. The movements of his hands and the expressions of his mouth and eyes seemed to indicate a person whose consciousness was fixed beyond the limitations of the mundane sphere. When he spoke, I felt obliged to ponder deeply his profound and logical statements. As I sat there at his feet trying to understand, he destroyed my intellectual pride. Each evening I would go to Srila Prabhupada's hut. How fortunate I was, I thought, to have come in contact with this person. Slowly, methodically, he was removing all of my misconceptions, bringing me to the platform of a sincere, inquisitive student of spiritual science. One evening I took a walk along the front of the property. The moon was full, illuminating everything, and the Ganges shimmered in the distance like a thread of silver. A mild breeze blew, and the atmosphere felt somehow purifying. Walking alone, I began to consider how my consciousness was changing. Looking back on my life, I could see how kind God had been to me; it seemed that every stage had been a step in His plan to bring me to this point. I stood by the side of the shining Ganges, watching her flow down to the ocean. Yes, I thought, now I must begin my journey back to Krishna. The next evening as we gathered at Srila Prabhupada's feet, I tried to explain that I would be leaving the next day to return to my work. Nervously I said, "Tomorrow I'll have to leave you and . . . "
Looking lovingly at me, he said, "Don't talk l-e-a-v-e, but talk l-i-v-e." Inconceivably, he seemed to address my soul directly. I suddenly became overwhelmed with love and appreciation for him. I felt such emotion that I had to excuse myself. Sitting down on the edge of a rice field, my eyes brimming with tears of happiness and relief, I knew my life would never be the same again. Srila Prabhupada wanted me to become a devotee, and I knew deep inside that this was all I had ever wanted. Although I returned to my work with the Peace Corps, I spent as much time with the devotees as possible. Finally I returned to New York. The devotees assured me that there was a temple in New York and that Srila Prabhupada would come there to visit. I wrote to Srila Prabhupada and explained what I was doing. I felt that by writing I had a direct link with him. We are just now typing up the tapes of those conversations we held in Mayapur, and we shall be publishing them as a book. It will be called "PERFECT QUESTIONS, PERFECT ANSWERS." . . . I shall be very much engladdened to meet you in New York once again. This was a great surprise. Srila Prabhupada considered the questions I had asked in my foolishness and ignorance to be perfect transcendental inquiries! It was an incredible honor, although I felt somewhat embarrassed. A month later Srila Prabhupada came to the New York temple. I went with my wife, Barbara, wanting her to meet him. Srila Prabhupada entered the hallway, and we all scattered flower petals and bowed down to offer respects. In my heart I was feeling very much ashamed, because although I had received so much instruction and encouragement from him, I had still not fully committed myself. I felt that I was letting him down. As he approached me, I bowed down to the floor, hoping that he would not see me. I kept my head down and offered the Sanskrit prayers very slowly. After saying the prayers, I raised my head, thinking he had passed by. Then I saw two bronze-colored feet before me, and I looked up to see Srila Prabhupada's beaming face. "Oh, it's you!" he exclaimed as I rose to my feet. He put his arms around my shoulders and gave me a welcoming embrace like a loving father. Everyone gave a loud exclamation of pleasure and jubilation that I had achieved such a place of affection in Srila Prabhupada's heart. He had literally embraced me into his fold. Two years later, when my wife and I were fully ready, Srila Prabhupada accepted us both as his formally initiated disciples. July 13, 1966. 26 Second Avenue, New York City: A few sympathetic, interested people gather in a small downtown storefront to help an Indian swami's mission by adding their signature to a legal document. Today, ISKCON has branches all over the world. Millions of lives have been transformed by the Hare Krishna mantra and the philosophy of the Bhagavad-gita—thanks to the vision of Srila Prabhupada and the efforts of his sincere followers. But in 1966, no one (except Prabhupada himself) could foresee how this society could ever manifest on such a scale. Here's an excerpt from Srila Prabhupada Lilamrita, a detailed biography of Srila Prabhupada, describing the humble yet momentous event of ISKCON's incorporation. 1966: The Lower East Side, New York. yet Srila Prabhupada's vision encompassed the whole world. Amid the cacophony of a storefront at 26 Second Avenue in New York, Srila Prabhupada had begun teaching the science of Krsna consciousness to a motley congregation drawn from the local community. Then, in his characteristically farseeing way, he founded the International Society for Krishna Consciousness. "We shall call our society 'ISKCON.' " Prabhupada laughed playfully when he first coined the acronym. He had initiated the legal work of incorporation that spring, while still living on the Bowery. But even before its legal beginning, Prabhupada had been talking about his "International Society for Krishna Consciousness," and so it had appeared in letters to India and in The Village Voice. A friend had suggested a title that would sound more familiar to Westerners, "International Society for God Consciousness," but Prabhupada had insisted: "Krishna Consciousness." "God" was a vague term, whereas "Krishna" was exact and scientific; "God consciousness" was spiritually weaker, less personal. And if Westerners didn't know that Krsna was God, then the International Society for Krishna Consciousness would tell them, by spreading His glories "in every town and village." "Krsna consciousness" was Prabhupada's own rendering of a phrase from Srila Rupa Goswami's Padyavali, written in the sixteenth century. Krsna-bhakti-rasa-bhavita. "to be absorbed in the mellow taste of executing devotional service to Krsna." But to register ISKCON legally as a nonprofit, tax-exempt religion required money and a lawyer. Carl Yeargens had already had some experience in forming a religious organization, and when he had met Prabhupada on the Bowery he had agreed to help. He had contacted his lawyer, a young Jewish man named Stephen Goldsmith. Stephen Goldsmith had a wife and two children and an office on Park Avenue, yet he maintained an interest in spirituality. 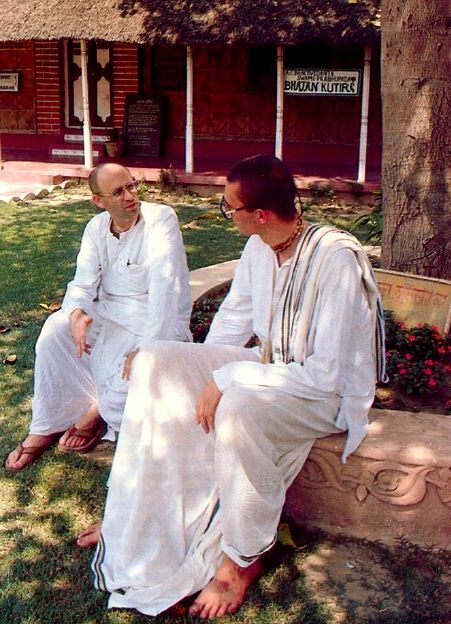 When Carl told him about Prabhupada's plans, he was immediately fascinated by the idea of setting up a religious corporation for an Indian swami. He visited Prabhupada at 26 Second Avenue, and they discussed incorporation, tax exemption, Prabhupada's immigration status—and Krsna consciousness. 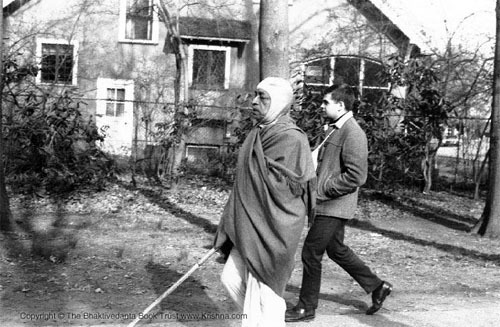 Mr. Goldsmith visited Prabhupada several times. Once he brought his children, who liked the "soup" Prabhupada cooked. He began attending the evening lectures, where he was often the only non-hippie member of the congregation. One evening, having completed all the legal groundwork and being ready to complete the procedures for incorporation, Mr. Goldsmith came to Prabhupada's lecture and kirtana to get signatures from the trustees for the new society. July 11. Prabhupada is lecturing. Mr. Goldsmith, wearing slacks and a shirt and tie, sits on the floor near the door, listening earnestly to the lecture, despite the distracting noises from the neighborhood. "I will give you a practical example of how things are misinterpreted. Just like our president, Mr. Goldsmith, he knows that expert lawyers, by interpretation, can do so many things. When I was in Calcutta, there was a rent tax passed by the government, and some expert lawyer changed the whole thing by his interpretation. The government had to reenact a whole law, because their purpose was foiled by the interpretation of this lawyer. So we are not out for foiling the purpose of Krsna, for which the Bhagavad-gita was spoken. But unauthorized persons are trying to foil the purpose of Krsna. Therefore, that is unauthorized. All right, Mr. Goldsmith, you can ask anything." Mr. Goldsmith stands, and to the surprise of the people gathered, he makes a short announcement asking for signers on an incorporation document for the Swami's new religious movement. Prabhupada: They are present here. You can take the addresses now. Mr. Goldsmith: I can take them now, yes. Prabhupada: Yes, you can. Bill, you can give your address. And Raphael, you can give yours. And Don.... Raymond. ... Mr. Greene. As the meeting breaks up, those called to sign as trustees come forward, standing around in the little storefront, waiting to leaf passively through the pages the lawyer has produced from his thin attache, and to sign as he directs. Yet not a soul among them is committed to Krsna consciousness. The lawyer meets his quota of signers, but they're merely a handful of sympathizers who feel enough reverence toward the Swami to want to help him. The first trustees, who will hold office for a year, "until the first annual meeting of the corporation," are Michael Grant (who puts down his name and address without reading the document), Mike's girlfriend Jan, and James Greene. No one seriously intends to undertake any formal duties as trustee of the religious society, but they are happy to help the Swami by signing his fledgling society into legal existence. According to law, a second group of trustees will assume office for the second year. They are Paul Gardiner, Roy, and Don. The trustees for the third year of office are Carl Yeargens, Bill Epstein, and Raphael. No one knows exactly what the half-dozen legal-sized typed pages mean, except that "Swamiji is forming a society." Why? For tax exemption, in case someone gives a big donation, and for other benefits an official religious society might receive. But these purposes hardly seem urgent or even relevant to the present situation in the little storefront. Who's going to make donations? Except maybe for Mr. Goldsmith, who has any money? But Prabhupada is planning for the future, and he's planning for much more than just tax exemptions. He is trying to serve his spiritual predecessors and fulfill the scriptural prediction of a spiritual movement that is to flourish for ten thousand years in the midst of the Age of Kali. Within the vast Kali Age (a period that is to last 432,000 years), the 1960s are an insignificant moment. The Vedas describe that the time of the universe revolves through a cycle of four "seasons," or yugas, and Kali-yuga is the worst of times, in which all spiritual qualities of men diminish, until humanity is finally reduced to a bestial civilization devoid of human decency. Yet for ten thousand years after the advent of Lord Caitanya there is the possibility of a Golden Age of spiritual life, an eddy that runs against the current of Kali-yuga. With a vision that soars off to the end of the millennium and far beyond, and yet with his two feet planted solidly on Second Avenue, Srila Prabhupada has begun an International Society for Krishna Consciousness. He has many practical responsibilities: he has to pay the rent, and he has to incorporate his society and pave the way for a thriving worldwide congregation of devotees. Somehow, he doesn't see his extremely reduced present situation as a deterrent from the greater scope of his divine mission. He knows that everything depends on Krsna, so whether he succeeds or fails is all up to the Supreme. He has only to try. The purposes stated within ISKCON's articles of incorporation reveal Prabhupada's thinking. They are seven points; similar to those given in the Prospectus for the League of Devotees he had formed in Jhansi, India, in 1953. That attempt had been unsuccessful, yet his purposes remained unchanged. 1. To systematically propagate spiritual knowledge to society at large and to educate all peoples in the techniques of spiritual life in order to check the imbalance of values in life and to achieve real unity and peace in the world. 2. To propagate a consciousness of Krishna, as it is revealed in the Bhagavad-gita and Srimad-Bhagavatam. 3. To bring the members of the Society together with each other and nearer to Krsna, the prime entity, and thus to develop the idea within the members and humanity at large that each soul is part and parcel of the quality of Godhead (Krsna). 4. To teach and encourage the sankirtana movement, congregational chanting of the holy name of God as revealed in the teachings of Lord Sri Caitanya Mahaprabhu. 5. To erect for the members and for society at large a holy place of transcendental pastimes dedicated to the Personality of Krsna. 6. To bring the members closer together for the purpose of teaching a simpler and more natural way of life. 7. With a view towards achieving the aforementioned purposes, to publish and distribute periodicals, magazines, books and other writings. Regardless of how ISKCON's charter members regarded the Society's purposes, Srila Prabhupada saw them as imminent realities. As Mr. Ruben, the subway conductor who had met Prabhupada on a Manhattan park bench in 1965, remembers, "He seemed to know that he would have temples filled up with devotees. 'There are temples and books,' he said. 'They are existing, they are there, but the time is separating us from them.' "
The first purpose mentioned in the charter was propagation. "Preaching" was the word Prabhupada most often used. For him, preaching had a much broader significance than mere sermonizing. Preaching meant glorious, selfless adventures on behalf of the Supreme Lord. Lord Caitanya had preached by walking all over southern India and inducing thousands of people to chant and dance with Him in ecstasy. Lord Krsna had preached the Bhagavad-gita while standing with Arjuna in his chariot on the Battlefield of Kuruksetra. Lord Buddha had preached, Lord Jesus had preached, and all other pure devotees preached. ISKCON's preaching would achieve what the League of Nations and the United Nations had failed to achieve—"real unity and peace in the world." ISKCON workers would bring peace to a world deeply afflicted by materialism and strife. They would "systematically propagate spiritual knowledge," knowledge of the nonsectarian science of God. It was not that a new religion was being born in July of 1966; rather, the eternal preaching of Godhead, known as sankirtana, was being transported from East to West. And this new consciousness in the West would come about through the teachings of Bhagavad-gita and Srimad-Bhagavatam. The Society's members would come together, and by hearing the philosophy of Krsna consciousness and chanting the Hare Krsna mantra in mutual association they would realize that each was a spirit soul, eternally related to Krsna, the Supreme Personality of Godhead. They would then preach these realizations to "humanity at large," especially through sankirtana, the chanting of the holy name of God. ISKCON would also erect "a holy place of transcendental pastimes dedicated to the Personality of Krsna." Was this something beyond the storefront? Yes, certainly. He never thought small: "He seemed to know that he would have temples filled up with devotees." 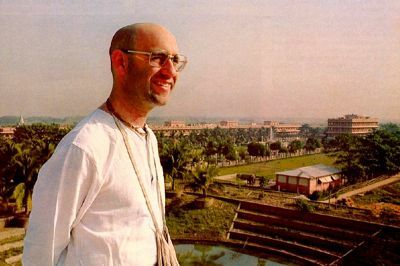 He wanted ISKCON to demonstrate "a simple, more natural way of life." Such a life (Prabhupada thought of the villages of India, where people lived just as Krsna had lived) was most conducive to developing Krsna consciousness. And all six of these purposes would be achieved by the seventh: ISKCON would publish and distribute literature. This was the special instruction given to Srila Prabhupada by Srila Bhaktisiddhanta Sarasvati Thakura, who had specifically told him one day in 1935 at Radha-kunda in Vrndavana, "If you ever get any money, publish books." Certainly none of the signers saw any immediate shape to Prabhupada's dream, yet these seven purposes were not simply theistic rhetoric invented to convince a few New York State government officials. He literally meant to enact every item in the charter. Of course, he was now working in extremely limited circumstances. The sole headquarters for the International Society for Krishna Consciousness was "the principal place of worship, located at 26 Second Avenue in the city, county, and state of New York." Yet Prabhupada insisted that he was not living at 26 Second Avenue, New York City. His Guru Maharaja had gone out from the traditional holy places of spiritual meditation to preach in cities like Calcutta, Bombay, and New Delhi. And yet Prabhupada would say that his spiritual master had not really been living in any of those cities, but was always in Vaikuntha, the spiritual world, because of his absorption in devotional service. Similarly, the place of worship, 26 Second Avenue, was not a New York storefront, a former curiosity shop. It was a small place, but it had now been spiritualized. The storefront and the apartment were now a transcendental haven. "Society at large" could come here; the whole world could take shelter here, regardless of race or religion. Plain, small, and impoverished as it was, Prabhupada regarded the storefront as "a holy place of transcendental pastimes, dedicated to the Personality of Krsna:" It was a world headquarters, a publishing house. a sacred place of pilgrimage, and a center from which an army of devotees could issue forth and chant the holy names of God in all the streets in the world. The entire universe could receive Krsna consciousness from the International Society for Krishna Consciousness, which was beginning here. If you'd like to read the rest of the story, send us an email. We expect to receive a shipment of Srila Prabhupada Lilamrita this month. 1. Krishna consciousness means clear consciousness. 2. Material existence means hazy consciousness. 3. Identifying the body as self is hazy consciousness. 4. One has to understand himself first before making progress in Krishna consciousness. 5. [The] Constitutional position of a living entity is being [the] eternal servant of Krishna, or God. 6. God or Krishna means the Supreme Person and the supreme cause of all causes. 7. Forgetfulness of the eternal relationship to God, or Krishna, is the beginning of hazy consciousness. 8. To revive the original clear consciousness of the living entities, the Vedic literatures are there. b. The Upanishads - numbering at least 108.
e. The Ramayana (original Valmiki). g. And any book following the tenets. 10. The Bhagavad-gita is part of the Mahabharata. 11. The original Veda is [the] Atharva-veda, later on divided into four for divisional understanding. 12. Mahabharata is called the fifth Veda and is meant for [the] less intelligent class of men who love history more than philosophy. 13. Bhagavad-gita, being part of [the] Mahabharata is the essence of all Vedic knowledge for [the] less intelligent class of men in this Age. 14. B.G. is called the "Bible of the Hindus," but actually it is the Bible for the human race. a. What is a living being. b. He is not the body but spirit soul. c. The spirit soul is encaged in [a] material body. d. The body is subjected to birth, death, old age, and diseases. e. The spirit soul is eternal, never takes birth or dies but he exists even after the annihilation of the material body. f. The living entity is transmigrating from one body to another. g. He can however stop this transmigration process and attain [an] eternal, blissful life of knowledge by Krishna consciousness. a. God is individual person. He is chief of all other persons of different parts — namely the demigods, the human beings, animals and the birds, insects, trees, and aquatics. b. All these living entities are sons of God, and therefore they are all servants of God. "Acharya" is a documentary-style film on the life of Srila Prabhupada. Part 2 contains excerpts from interviews with news reporters and scholars. Part 5 shows Srila Prabhupada instructing his leaders in money management, challenging social welfare representatives on the meaning of social welfare, and predicting the end of the world. On the morning of September 17, 1959, in the fifty-by-twenty-five-foot Deity room on the second floor of the Keshavaji Math, a group of devotees sat before the Deities of Radha-Krishna and Lord Chaitanya. The Deities were colorfully dressed in royal clothing and silver crowns. Radharani's right hand faced palm-forward in benediction for the worshiper; at Her side, Her left hand held a flower for Krishna. Krishna stood like a dancer, placing His right leg in a casual tiptoe pose before His left, playing His long silver flute, which He held gracefully to His red lips. His long black hair reached down past His shoulders, and the garland of marigolds around His neck reached down to His knees. On His right stood the Deity of Lord Chaitanya, His right arm raised, left arm at His side, His body straight, feet together. He was a soft golden color, and He had large eyes, a well-formed red mouth, and straight black hair down to His shoulders. One level below the Deities were pictures of the spiritual masters in disciplic succession: Jagannatha dasa Babaji, Bhaktivinoda Ṭhakura, Gaurakishora dasa Babaji, Bhaktisiddhanta Sarasvati, Bhakti prajnana Keshava Maharaja. Abhay sat on a mat of kusha grass beside ninety-year-old Sanatana, also to receive sannyasa that day. Sitting opposite the two candidates, Narayana Maharaja, Keshava Maharaja's disciple, prepared to conduct the ceremony of mantras and offerings of grains and ghee into the fire. Akincana Krishnadasa Babaji, Abhay's Godbrother, known for sweet singing, played mridanga and sang Vaishnava bhajanas. Sitting on a raised asana, His Holiness Keshava Maharaja presided. Since there had been no notices or invitations, only the maṭha's few residents attended. Narayana Maharaja chanted the required mantras and then sat back silently while Keshava Maharaja lectured. Then, to everyone's surprise, Keshava Maharaja asked Abhay to speak. Abhay had not expected this. As he looked around at the gathering of devotees, he understood that the common language was Hindi; only Keshava Maharaja and a few others spoke English. Yet he knew he must speak in English. After Abhay's speech, each initiate received his sannyasa-danda, the traditional head-high staff made of four bamboo rods bound together and completely enwrapped in saffron cloth. They were given their sannyasa garments: one piece of saffron cloth for a dhoti, one for a top piece, and two strips for underwear. They also received tulasi neck beads and the sannyasa-mantra. Keshava Maharaja said that Abhay would now be known as Bhaktivedanta Swami Maharaja and that Sanatana would be Muni Maharaja. After the ceremony, the two new sannyasis posed for a photo, standing on either side of their sannyasa-guru, who sat in a chair. Keshava Maharaja didn't impose any strictures on Abhay; he simply encouraged him to go on preaching. Yet Abhay knew that to become A.C. Bhaktivedanta Swami did not mean merely that he was giving up family, home comforts, and business. That he had done five years ago. Changing from white cloth to saffron cloth, from Abhay Babu to Bhaktivedanta Swami Maharaja, had a special significance: it was the mandate he had required, the irrevocable commitment. Now it was only a matter of time before Bhaktivedanta Swami would travel to the West as Bhaktisiddhanta Sarasvati had ordained. This was Bhaktivedanta Swami's realization of his new sannyasa status. "Seeing his enthusiasm and ability to write articles in Hindi, English, and Bengali, Bhaktisiddhanta Sarasvati Maharaja gave him the instruction to take tridandi-sannyasa. For nearly one year he had been ready to accept sannyasa. In the month of Bhadra, on the day on which Vishvarupa accepted sannyasa, Bhaktivedanta Swami at the Shri Keshavaji Gaudiya Math accepted sannyasa from the founder of the Vedanta Samiti, Bhaktiprajnana Keshava Maharaja. Seeing him accept his ashrama of renunciation, seeing this pastime for accepting the renounced order of life, we have attained great affection and enthusiasm." Read more about Srila Prabhupada's taking sannyasa in the Prabhupada Lilamrita online. When I first met my spiritual master, His Divine Grace A.C. Bhaktivedanta Swami Prabhupada, I felt that there was never a time when I did not know him. I never tire of telling of my first meeting with him on the streets of Lower East Side New York. At the time, I was hurrying from my Mott Street apartment, which had become a refuge for psychedeliacs, to a much quieter apartment on Fifth Street where I hoped to get some peace. 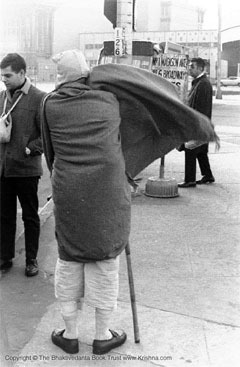 I was walking down Houston Street and across Bowery, past the rushing traffic and stumbling derelicts, and after crossing Bowery, just before Second Avenue, I saw His Divine Grace jauntily strolling down the sidewalk, his head high in the air, his hand in a beadbag. He struck me like a famous actor in a very familiar movie. He seemed ageless, though later I found out that he was seventy years old. He was wearing the traditional saffron-colored robes of a sannyasi, the renounced order, and quaint white shoes with points. Coming down Houston Street, he looked like the genie that popped out of Aladdin's lamp. I was fresh from a trip to India, and His Divine Grace reminded me of the many holy men I had recently seen walking the dirt roads of Hardwar and Hrishikesh and bathing in the Ganges. I had gone to India to look for a guru but had returned disappointed. It was on this bright July morning, when I was least expecting it, that Sri Krishna, out of His infinite mercy, sent guru to me. The old Vedic adage—by the grace of Krishna you get guru, and by the grace of guru you get Krishna—was justified. Afterwards, Srila Prabhupada (as we were later to call him) often told me, "If you are sincere, you don't have to search out your guru. Krishna will send him." So amid the hot clang and clamor of Houston and Bowery, guru had found me out. We stopped simultaneously, and I asked the first question that popped into my mind—"Are you from India? "—and he smiled cordially. "Oh, yes, and you?" I told him no, but that I had just returned from India and that I was very interested in his country and Hindu philosophy. He then told me that he had come from Calcutta and had been in New York almost ten months. His eyes were as fresh and as cordial as a child's, and even standing before the trucks that roared and bumbled their way down Houston Street, he emanated a cool tranquility that was unshakably established in something far beyond the great metropolis that roared around us. He answered all my questions readily, as though speaking a dialogue he was well acquainted with. I told him about my India trip briefly, and he asked me if I had been to Vrindavan. "I didn't get a chance to," I told him. "I got sick on the food and had to leave." He then informed me that he had a place around the corner where he was planning to hold some classes and that he had been wondering whether or not it was suitable. I walked around the corner with him, and he pointed out a small storefront building between First and Second Streets, next door to a Mobil filling station. 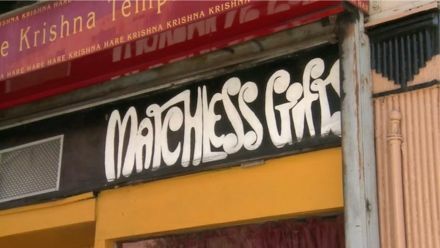 It had been a curiosity shop, and someone had painted the words "Matchless Gifts" over the window. At the time I didn't realize how prophetic the words were. "This is a good area?" he asked me. I told him that I thought it was. I had no idea what he was going to offer in his "classes," but I knew that all my friends would be glad that an Indian swami was moving into the neighborhood. For the past two or three years, like so many downtown New Yorkers in their twenties, we had been reading books on Eastern philosophy and religion, burning lots of candles and incense and taking gaïja, peyote and LSD as aids to meditation. Actually it was more intoxication than meditation; meditation was a euphemism that somehow connected our highs with our readings. "I would like to hear your lectures," I told him, after reassuring him that the storefront was suitable. I noticed a placard in the window that read: "Lectures on Bhagavad-gita. A.C. Bhaktivedanta Swami. Mon. Wed. Fri. 7-9." "You will bring your friends?" he asked. "Yes," I promised. "Monday evening." I forget the rest of the conversation, but I do remember afterwards telling everyone I knew about the guru who had inexplicably appeared in our midst. I attended the first meeting in the little storefront with two of my friends who were later to be initiated as Kirtanananda and Umapati. I was surprised to see half a dozen people there. The storefront was narrow and squalid. There was no rug on the wooden floors and no decorations save one painting in the window of Lord Chaitanya dancing with His disciples. Years later I was to find out that this was painted by an artist who had been given a small picture by Srila Prabhupada to use as a model for a larger canvas. The only additions to the plain storefront were little straw mats for sitting. At the rear were two windows, a bathroom door and an unattractive sink. In the middle of the room a bare light bulb hung from a cord. Umapati, Kirtanananda and I sat in the middle of the room and looked around at a half dozen other young men who, like us, didn't know what to expect. We sat quietly and waited for about five minutes. Then the door opened and out came His Divine Grace. He deftly slid the white pointed shoes off his feet, sat down on one of the straw mats and looked out at his new audience. When he saw me he smiled. "You have brought your friends?" I said, "Yes." "Very good," he said and took out a pair of cymbals. He started to play them and sing, "Vande 'ham" and then Hare Krishna, Hare Krishna, Krishna Krishna Hare Hare/ Hare Rama, Hare Rama, Rama Rama, Hare Hare. He indicated that we were to answer the chanting of Hare Krishna, and slowly, awkwardly at first, we tried to follow. There were no other instruments—only the clanging of three pairs of cymbals. Eventually we started clapping, but no one got up to dance. I noticed that about a dozen people had gathered outside the window to watch. Srila Prabhupada finally brought the chanting to a close and recited a prayer. Nobody bowed. Nobody knew what to do. We all simply sat in anticipation. Then he began his lecture, using Bhagavad-gita. I recall that in those early lectures he spoke mainly in terms of Absolute Truth to better communicate with us. No one had the slightest idea what "Krishna" meant. I had read Gita before, and so had my friends, but to us Krishna, at most, was just a literary personification of the Divine, a characterization of Shankaracarya's Self. At that first meeting I had some difficulty understanding what Srila Prabhupada said, but his words nonetheless moved me, and I was interested to hear more. I noticed that my friends were also listening attentively, and most of the others seemed to show respect. Then, incredibly, midway through the lecture, an old white-haired begrizzled Bowery bum entered the storefront and walked right through the middle of the room, past all of us who sat in shocked silence, and on up towards Srila Prabhupada, who sat beneath the back windows. I didn't know what he was about to do, but I noticed that he was carrying a package of paper hand-towels and a couple of rolls of toilet paper. He didn't say a word, but walked right past Srila Prabhupada and carefully placed the hand-towels by the sink and the toilet paper on the floor under the sink. Then, clearing his throat and saying something incoherent, he turned around and walked out. No one knew what to say and no one knew whether or not Srila Prabhupada had been insulted. "Just see," Srila Prabhupada suddenly said. "He has just begun his devotional service. That is the process. Whatever we have—it doesn't matter what—we must offer it for Krishna's service." He then concluded his lecture and led another chanting of Hare Krishna. The first chanting lasted forty-five minutes, his lecture lasted at least an hour, and the second chanting lasted around thirty minutes. A couple of people left after the lecture. Americans are simply not accustomed to sitting on the floor for over two hours. After the second kirtana, Srila Prabhupada sliced up an apple and passed it to us on a plate. While this was being distributed, he went out the side door and returned to his apartment in the rear building. I noticed a basket on the front mat in which some people had put a little money. I contributed fifty cents, and then my friends and I left. On our way out one of the boys told us that the next meeting would be Wednesday at seven o'clock but that Srila Prabhupada would also welcome people in his rear apartment during the day. We attended the next meeting Wednesday night. It followed the same format as the first. After the last kirtana, I went up to Srila Prabhupada and began to question him. "Have you ever heard of LSD?" I asked. "It's a psychedelic drug that comes like a pill, and if you take it you can get religious ecstasies. Do you think that that can help my spiritual life?" "You don't need to take anything for your spiritual life," he told me. "Your spiritual life is already here." I agreed with him immediately, although I would have never agreed with anyone else who would have said such a thing. I agreed mainly because he seemed so absolutely positive that there was no question of not agreeing. "Yes, my spiritual life is here," I thought to myself. I knew that he was in a state of exalted consciousness, and I was hoping that somehow he could teach the process to me. The next morning I went around to his apartment to see him alone. He welcomed me in and told me that he needed help in spreading this philosophy. I noticed that he was typing, and I asked if I could be of any help there. I was a very good typist, and not knowing any other way to help, offered my services. He handed me the first chapter of the Second Canto of Srimad-Bhagavatam and asked if I could type it out. I set up a typewriter in his room and began to work. I typed most of the morning and then told him that if there was any more typing he needed done, to let me know, that I would be glad to take it home. "Oh, I. have lots more," he said, opening his closet door and pulling out two huge bundles of paper tied with saffron cloth. There were thousands of pages in the bundles. I was astounded. It looked like a lifetime of typing. The next week, which was the first week in a sultry New York August, a time when the air hangs so hot and heavy that it obscures the tops of buildings with a yellow mist, Srila Prabhupada received a box of handbills which had been donated by a friend. There must have been five thousand of them, and they read: "Practice the transcendental sound vibration Hare Krishna, Hare Krishna, Krishna Krishna, Hare Hare/ Hare Rama, Hare Rama, Rama Rama, Hare Hare. This chanting will cleanse the dust from the mirror of the mind." Then Srila Prabhupada's name was given and the name of the International Society for Krishna. Consciousness, 26 Second Avenue, and the times of the meetings—7:00 A.M. daily and 7:00 P.M. Monday, Wednesday and Friday. At the bottom of the sheet was the invitation: "You are cordially invited to come and bring your friends." "There they are," Srila Prabhupada told us. "Now you simply have to distribute." I took a handful of the bills. "You think they're all right?" he asked me. I told him I thought they were fine. "We will call our society ISKCON," he then told us, smiling. "What's that?" I asked. "I-S-K-C-O-N," he spelled the letters out. "ISKCON—International Society for Krishna Consciousness." Then he laughed. He was obviously having fun. It was also in early August that we began attending the early morning meetings. None of us had ever gotten up before ten or eleven in the morning, but the magnetism of Srila Prabhupada drew us out of our dark Mott Street dens at 6:30 and down from fifth floor apartments into deserted Lower East Side streets. I would walk briskly over to Srila Prabhupada's, chanting Hare Krishna and feeling better than ever before. Miraculously, the Lower East Side no longer looked drab. The sidewalks and buildings seemed to sparkle, and in the early morning, before the smog set in, the sky was red and golden. I would sing all the way to his front foyer then ring the buzzer marked A.C. Bhaktivedanta Swami, and the door would buzz and open, and I would go through the hallway on through the small patio between the back apartment and the storefront and up to his small second floor apartment, tip-toeing quietly in order not to awaken the neighbors. Those early morning meetings were the most beautiful and most intimate. "Softly," he would say, just lightly touching the cymbals together, and we would barely touch our hands to clap. He would chant "samsara-davanala-lidha-loka" with his eyes closed and sit in the rays of sun that streamed through the windows in the early morning. We would listen, entranced, then join in response to Hare Krishna. Afterwards he would give a copy of Bhagavad-gita to one of us and would have us read the Sanskrit transliterations, correcting our mispronunciations, and then the text. Then he would begin to explain each verse thoroughly. There were only six or eight of us at these meetings, so we had ample opportunity to discuss the philosophy with him. Actually, by Krishna's mercy, I had nothing else to do. I had returned from India with practically no money, and though I hadn't worked for over a year, I wasn't even interested in looking for a job. I did have a feeling, however, that the Bhagavad-gita was a key to a larger consciousness of which I could somehow partake. I desperately wanted a teacher to lead me into a world which I knew existed and which I felt was very near to me, yet somehow could not reach. Shortly after we distributed the handbills, Srila Prabhupada informed us that he would like to go out into one of the parks to chant. This surprised us all, and after conferring we decided that Washington Square was the best place. It was on a Sunday, when Washington Square is most crowded, that we followed Srila Prabhupada down the side streets of the Lower East Side to the park. There must have been about ten of us then, and I remember the stares Srila Prabhupada's saffron robe, beadbag and pointed white shoes received. It was almost like following a Martian down the street. Somehow he floated through it all, seemingly unaware of the stares, comments and general sensation he was creating. We walked through the Sunday crowds of Washington Square, and finally Srila Prabhupada chose a place to sit down on the grass next to teenagers who were kissing and playing bongo drums. There was a sign that said "Keep Off the Grass," but everyone ignored it. Srila Prabhupada pulled up his robes and sat comfortably and solidly upon the ground, and we followed suit self-consciously. He played a pair of cymbals and led us chanting Hare Krishna, Hare Krishna, Krishna Krishna, Hare Hare/ Hare Rama, Hare Rama, Rama Rama, Hare Hare. By that time one of us had acquired a small drum and managed to follow Srila Prabhupada's rhythm. We chanted about three minutes and immediately a crowd gathered around us. I remember one sailor who listened for a few seconds then threw his cigarette to the ground and huffed, "What the hell is this?" Very quickly the police swooped down on us, and one of the policemen asked who was in charge of our group. We could only indicate Srila Prabhupada. The policeman turned to him and said, "Don't you see the sign?" 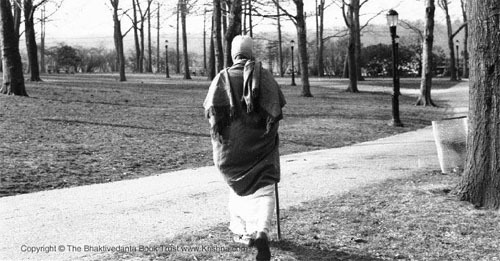 Srila Prabhupada looked again at the "Keep Off the Grass" sign, then smiled charmingly and walked down onto the asphalt. We followed him and asked if he wanted someone to run back to the temple to get a rug, but he said "No," and once more sat down firmly, this time on the hot asphalt, and we sat in a circle around him. "Disparity in the human society is due to the basic principle of a godless civilization. There is God or the Almighty One from whom everything emanates and by whom everything is merged to rest. The material scientist is trying to find out the ultimate source of creation very insufficiently, but it is a fact that there is one ultimate source of everything that be. This ultimate source is explained rationally and authoritatively in the beautiful Bhagavatam or Srimad-Bhagavatam." When reading this passage, I did not recognize my own voice, for it seemed to me that a larger voice was speaking through me. The kirtana, which was the first that any of us had ever attended in public, had a strangely exhilarating effect on us all. We felt divinely intoxicated, and I marveled at the unusual power of the mantra when chanted publicly. Actually Lord Chaitanya specifically recommended sankirtana, or the public chanting of Hare Krishna amidst many people, for this age of chaos (Kali). After the kirtana, we asked Srila Prabhupada whether he thought our public performance successful. He was so happy with it that he requested that we go out every afternoon and chant in the streets and parks. Following his request, about six or eight of us would walk around the Village in the afternoon and even up and down the narrow streets of Chinatown, playing a bongo drum and cymbals and chanting the magic mantra. We must have looked pretty ragged, and I'm sure we didn't make much of an impression, but there was lots of spirit. Despite our bumbling selves, Srila Prabhupada had launched Lord Caitanya's sankirtana movement in the Western world. Vyasa-puja is an annual offering of special honor—puja—to the spiritual teacher, who represents Krishna Himself as well as Krishna's incarnation Vyasadeva, the editor of the Vedas. Krishna recommends everyone seeking God to first seek out God's representative and respectfully accept his guidance. Members of the International Society for Krishna Consciousness consider Srila Prabhupada the spiritual guide for everyone within the Society. 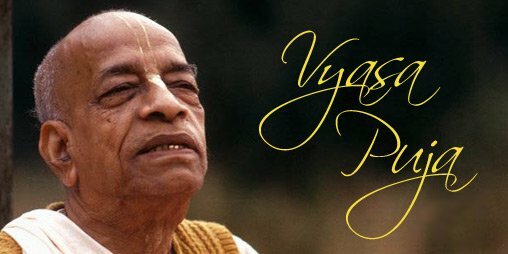 Each year, we publish a Vyasa-puja book—a collection of homages to Srila Prabhupada—from devotees and temples all over the world. These books are available for download here. "Actually there is no difference between hearing directly from Krishna and hearing directly from Krishna via a bona fide spiritual master like Vyasa. The spiritual master is the representative of Vyasadeva also. Therefore, according to the Vedic system, on the birthday of the spiritual master the disciples conduct the ceremony called Vyasa-puja." "Even though we may not have the fortune to contact the Supreme Lord personally, the Lord's representative is as good as the Lord Himself because such a representative does not say anything unless it is spoken by the Supreme Personality of Godhead. . . The bona fide guru is he who has accepted Krishna as guru. This is the guru-parampara system. The original guru is Vyasadeva because he is the speaker of Bhagavad-gita and Srimad-Bhagavatam, wherein everything spoken relates to Krishna. Therefore guru-puja is known as Vyasa-puja. In the final analysis, the original guru is Krishna, His disciple is Narada, whose disciple is Vyasa. . One cannot become a guru if he does not know what the Personality of Godhead Krishna or His incarnation wants. The mission of the guru is the mission of the Supreme Personality of Godhead: to spread Krishna consciousness all over the world." "Since Vyasadeva is the original guru (spiritual master) of all who follow the Vedic principles, worship of the spiritual master is called Vyasa-puja." "The transcendental knowledge of the Vedas was first uttered by God to Brahma, the creator of this particular universe. From Brahma the knowledge descended to Narada, from Narada to Vyasadeva, from Vyasadeva to Madhva, and in this process of disciplic succession the transcendental knowledge was transmitted by one disciple to another. . . The knowledge that we receive from our Gurudeva is not different from that imparted by God Himself and the succession of the acharyas in the preceptorial line of Brahma. We adore this auspicious day as Sri Vyasa-puja-tithi, because the Acharya is the living representative of Vyasadeva, the divine compiler of the Vedas, the Puranas, the Bhagavad-gita, the Mahabharata, and the Srimad-Bhagavatam."